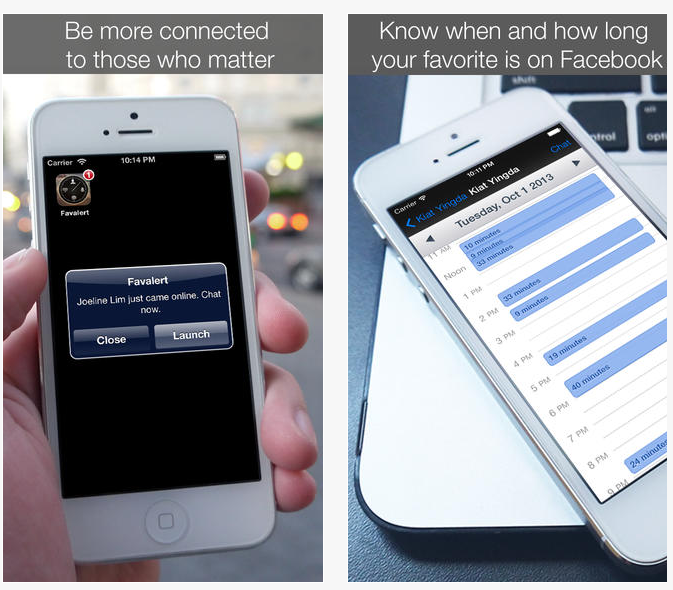 Fav Alert: Facebook Personalised Alerts, developed by AlertStocks, is the perfect stalking app. Well you do not need to be classified as a stalker if you want to keep tabs on friends. This application makes Facebook way more exciting. Fav Alert will alert you of import information about your friends with such things as telling you when someone logs onto Facebook, how much time they spend, what they do and more! When you first launch the app you will want to give full permission to Fav Alert so that it can access your basic profile info, list of friends, and your news feed. You will also want to allow push notifications so that you will get an alert of all the actions you are interested in. Once you have added a Facebook contact to your Fav Alert, you can eventually view their history and see when and how long they have been on Facebook. Some of the alerts that you can receive are when they go online, go offline, and post status updates. You can set a specific sound for each person so you know who is alerting you even if your phone is in your pocket. Fav Alerts is currently a FREE application on the Apple AppStore, but encourages you to purchase the premium in-app purchases. Some of the extra features include the ability to add up to the maximum 40 favorites, improve alerts from 10 minutes to every minute, Advanced alerts which include: work time, history, offline, and sounds. If you are interested in keeping up with your friends and what they are doing on Facebook, Fav Alert is a must have app for you. Hopefully the developer will keep updating the app since Facebook seems to update all of the time and breaks certain features required for this app to run correctly.